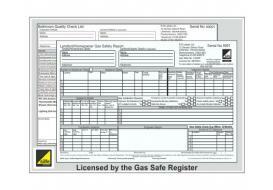 All labels displaying the Gas Safe Register logo are licensed by the Gas Safe Register. A complete range of personalised Plumbing and Gas Certificates from as little as £10.50 a book. All books are 2 part (1 NCR, 1 left in book) or 3 part (2 NCR, 1 left in book) in sets of 50 or 25. Our certificates have serials numbers and come with all your details pre-printed and bound together with a strong binding strip. 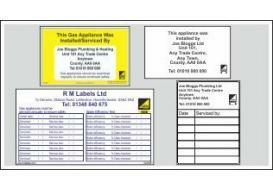 We can produce A4 or A5 forms to your own layout. Please note our range of Gas Certificates are licensed by the Gas Safe Register and can only be sold to Gas Safe Registered Installers. 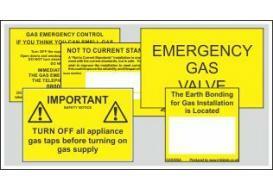 Self-adhesive vinyl Gas Safe logos personalised with your company's Gas Safe registration number available in four sizes. number and check your registration details before processing the order. ©Copyright 2018 by R M Labels Limited. All Rights Reserved.